We recently partnered with a church-based ministry in Zambia called the Kachere Development Program in an effort to tackle a terrible water crisis facing poor rural villages. 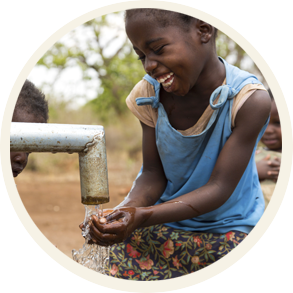 Our goal was to provide 19 wells, 40 latrines and health education – all in the name of Jesus! Thanks to your amazing generosity, we’ve achieved that goal! What a joy it is to watch families pump an abundant supply of clear, refreshing water from new wells instead of scooping muddy, contaminated water from streams and shallow ditches. Local water and sanitation committees have been trained to keep the wells in good working order, and the presence of the new latrines will go a long way toward preventing contamination of the water table. In other words, families will be able to enjoy clean water for years to come! To read a detailed update on the success of this outreach to Zambia’s poor, please download the report and letter below. Thank you for answering the call to help our brothers and sisters in Zambia attain clean, abundant water!